Nicola Sturgeon, First minister of Scotland, today announced she will seek a second Independence Referendum for Scotland, possibly to be held between the Autumn of 2018 and Spring of 2019. This should be very interesting indeed. North of the Border project 2.0 coming soon then folks. From Scotland with Love is a visually stunning documentary film from director Virginia Heath put together using archive footage from the National Library of Scotland and Scottish Screen Archive. A purely visual film with an accompanying soundtrack from King Creosote and musical direction by David McAulay it's a touching look at the rich culture of life in Scotland over the years. The film touches on themes that include: work and play, love and loss, migration, fishing, heavy industry, shipbuilding, war and protest, urbanisation and emigration, community, seaside holidays and a good night out. There are some great images to be found throughout the 75 minute documentary. The famous advert that my fishermen friend in Ullapool was telling me about. Featuring a fine array of Scotland's amazing landscapes plus Dave Beckham on a motorbike and some of his rich mates. Totally believable plot. Slàinte! So, today is my final day in Scotland and it's now time to fly back to Germany. Just want to say thank you to all the amazing people from all over Scotland that I've met along the way. This last month has been an amazing experience. See you again soon folks. Cheers. So here it is. The day of the referendum. See you on the other side. The evening I arrived in Dundee I had a great walk up the hill to The Law (Law being the Gaelic word for mound) This extinct volcano which commands fantastic views over the city down to the River Tay and beyond is a must see when visiting Dundee. The following morning I took a walk through the city via The Howff, an ancient burial ground in the city centre. The land was granted to the city for use as a burial place by Mary Queen of Scots in 1564 and contains the most important collection of tombstones in Scotland. A beautiful place with wild overgrown flowers and trees amongst the ancient stones. I then set off on my coast to coast road trip to Ullapool in the far north-west of Scotland. A journey of some 300 kilometres. I arrived in Ullapool in the the early evening and checked into my harbour front hotel and then had a stroll around the beautiful port town. I stumbled upon a great bar/restaurant/bookshop called The Ceilidh Place up the hill away from the harbour front. This was my kind of place. The bookshop was still open at 9pm (in a small fishing village) and the food, beer and whisky selection was magic. Then I met The Fisherman. He strolled into the bar and sat down next to me and proceeded to tell me about his evening. He had that look in his eye. He'd just come in from Loch Broom where he'd been tearing around up and down the coast looking for David Beckham and film director Guy Ritchie. They were holed up in a boat somewhere while they shot a whisky commercial. He naturally assumed there'd be a great party raging which he could gate crash. As they say in these parts "You couldnae make it up!". After spending a few days last weekend in Glasgow I am now on the road and travelling around Scotland. Last night was spent in the beautiful city of Dundee, the fourth largest city in Scotland, which lies on the north bank of the Forth of Tay. Next stop is Inverness. Hello there folks and welcome to Scotland. My 'North of the Border' project is now online. After months of editing and many visits back and forth between Germany and Scotland to shoot pictures the first images are now ready and online. 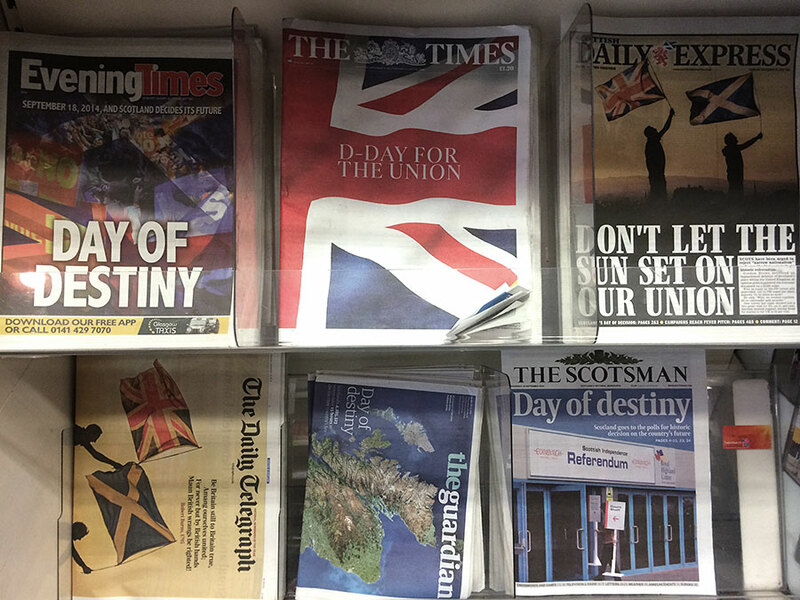 We are now into the final 10 days of the independence campaign and things took a dramatic turn at the weekend. The Yes campaign was ahead in the polls for the first time. The news reached us as we stood in the newly christened YES Bar in Glasgow's Drury Street chatting to folk from the Radical Independence campaign. Needless to say the place went mad. We made some new friends and had a brilliant night hanging out with the Yessers. Great fun. It will be interesting to see what transpires in the following days.